Soldsie, an e-commerce service enabling businesses to sell directly to their Facebook fans and Instagram followers through the comments section, has raised $4 million in Series A funding from First Round Capital, the company is announcing this morning. Others participating investors include SoftTechVC, Lerer Ventures, Correlation Ventures, Great Oaks Ventures, e.Ventures, 500 Startups and other individuals. Angels in the round included Ken Landis, Richard Gernstein, Greg Kidd, Tom Kelly, Prosper Nwampka, Seth Ginns and Christine Herron. The startup emerged at a time when the industry was questioning whether or not Facebook commerce, or “f-commerce,” as some had abbreviated it, was actually worthwhile. Soldsie, which first launched in May 2012, found that Facebook commerce could work, when it wasn’t just some other tab for users to click into, but could instead leverage the social activities already taking place across these retailers’, sellers’ and businesses’ Facebook profile pages. 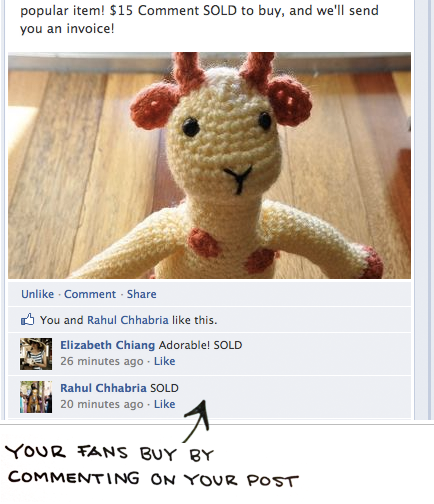 On Facebook, sellers were sharing photos of their items for sale, which fans would then comment on, like and re-share. Soldsie then added another layer to that ongoing activity – allowing visitors to comment “SOLD” in order to make a purchase. Consumers would only have to register one time with the Soldsie application, which allowed the business to access their personal data, including their email address. On the backend, Soldsie provides an interface for managing the invoicing process, with tools for tracking sales, invoices, inventory and more. Businesses simply email invoices to the customers who commented SOLD, and shoppers can then pay using PayPal or a credit card. Last November, the company introduced a similar system for Instagram, allowing consumers to shop via the photos’ comments section by typing “sold” alongside their email address. After first debuting in spring 2012, the company grew to reach 75 businesses by that fall, totaling over $1 million in transactions. By summer 2013, those numbers had grown to over 1,000 merchants, and over $10 million in transactions. Today, Soldsie reports 1,500 sellers, and north of $25 million in transactions, or three times higher than the same time last year. The company generates revenue by taking a small cut of each transaction along with a monthly minimum starting at $150, but is still experimenting with pricing. In addition, consumers who are commenting “sold” aren’t just impulse shopping then failing to pay. Notes Soldsie co-founder and CEO Chris Bennett, the company is now seeing a 70% conversion rate after shoppers write “sold” to claim an item, with 60% of checkouts taking place after 30 minutes – meaning people may be waiting to complete the purchase after they finish doing something else, like riding the bus home from work, for example. 70% of checkouts are also happening via mobile, he says. With the new funding, which brings Soldsie’s total raise to date to $5.6 million, the company plans to scale the business, hire, and further build out the Soldsie platform, including expanding it to two more platforms by the end of 2014. The 13-person team will grow to 25 by year-end, with new positions added in product development, engineering, sales, and account management, the company says. Bennett also mentions that Soldsie is now working with some “major retailers,” but says he’s not yet permitted to disclose these by name. Soldsie competes more broadly with other startups attempting to leverage social media for e-commerce, including Chirpify and Instagram shopping site Hashbag, for example. “We’re especially excited about this funding because we think it’s strong evidence of the product we’ve built, but also a strong vote of confidence in the rising wave of mainstream social commerce,” says Bennett.